Each of Mary Beth's albums will lead you through a peaceful journey of comfort and contentment, leaving you relaxed and refreshed. Mary Beth creates a consistent flow throughout her recordings with an elegant, beautifully distinctive style that has become a best-selling "signature sound" throughout the country. Whether romantic pop standards, inspirational arrangements or her original music, she passionately plays from the heart. A Bridge Over Time will lead you on an enchanting journey through elegant piano orchestrations. Offering an exciting blend of familiar, timeless favorites along with new hits sure to become classics, theres music here to please every listener. After The Rain presents a refreshing collection of uplifting piano orchestrations that showcase Mary Beth's passionate and sophisticated piano artistry. Listen as the strings sweep grandly over the melodies with their own musical life. Heirloom is a gift dedicated to the nation. An hour of listening pleasure offers a collection of favorites highlighting Americas musical heritage. Music of the Night ... Best of Broadway Best of Broadway collection of favorites plus 5 new arrangements "The brilliance of the marquee! Once in a Lifetime features an hour of relaxing piano/instrumental music. 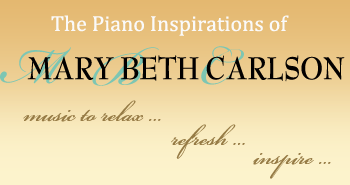 Smile ... with a song in your heart, Mary Beth's 21st piano orchestral CD, is a sensational variety of best-loved melodies spanning several decades. This collection provides something uniquely beautiful and different for a wedding ceremony, anniversary celebration, or simply for enjoying some relaxing, inspiring music! NEW RELEASE!! Timeless, Mary Beth's first solo piano CD, includes all new captivating arrangements of classic romantic melodies. Treasures Of The Heart offers 72 minutes of cherished love songs featuring a breathtaking medley from Titanic and Grammy Award winning selections, "How Do I Live" and "The Prayer". You Are My Sunshine... all-time favorite songs for the young and the young at heart, Mary Beth's twenty-third CD, is a uniquely fun and delightfully captivating package unlike any other CD in her collection.